SINTESI CONTENENTE UNA BREVE DESCRIZIONE DEL LAVORO SVOLTO E DEI RISULTATI OTTENUTI: Groundwater remediation is currently one of the major environmental challenges, considering the number of contaminated sites and the risk posed to human health and to the environment by exposure to groundwater contamination. 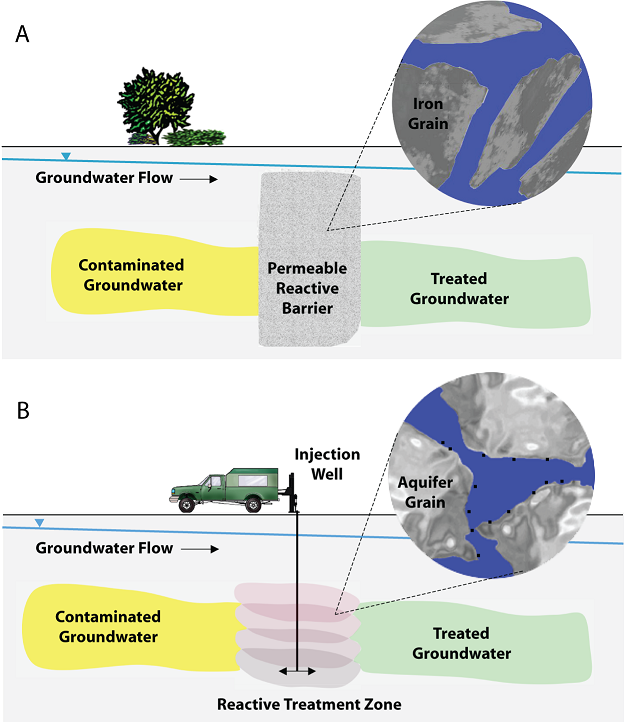 Permeable reactive barrier (PRB) is a passive in situ technology for the remediation of contaminated groundwater. It consists of a barrier placed perpendicularly to the contaminant flow and made of reactive material that treats contaminant plume flowing through it under the natural hydraulic gradient. It is the most cost-effective groundwater remediation technology, it allows the use of surface land and reduces the exposure of workers to contaminants. The most used reactive material is Zero Valent Iron, which is able to remediate groundwater contaminated by a large range of contaminants by means of different chemical and physical mechanisms. The main issue of granular ZVI use regards the reduction of the porous medium porosity, because of the expansive nature of corrosion products, precipitates and gas formation. To overcome this problem, mixtures of ZVI and internally porous granular materials were tested to investigate their long-term removal efficiency and hydraulic behavior. The use of volcanic Lapillus to be mixed with ZVI to remediate heavy-metals contaminated groundwater is proposed in this work. Tests on Lapillus showed a not negligible heavy metal removal efficiency of the volcanic material, while the hydraulic monitoring of column tests performed using mixtures showed a long-term hydraulic performance that can be compatible with the base soil. The developed models of removal efficiency observed in bast tests and of long-term removal efficiency and hydraulic behavior of the tested mixtures are tools for understanding the mechanisms involved in the reactive porous media and for designing a PRB.